That's the Denard we all know and love. "I want to say sorry to everybody who watches football, watches Michigan football and whoever follows Michigan football. I want to say sorry and it won't happen no more. I'm going to be accountable for the rest of the season, I can tell you that much. Whatever it takes for the team to win, that's what I'm going to do. I don't want to feel like this anymore." First of all, yes, a ton of credit to Denard for coming out and facing the music. He certainly didn't have to do that. But I guess part of being a senior and a captain is personal accountability. That shouldn't go unnoticed. But Deneard played maybe one of the worst games a quarterback at Michigan has ever played. It was almost as if it wasn't real. At halftime in the pressbox, I got together with a few other fellow bloggers and we just stood there in shock...sighing in between awkward pauses. What makes Denard so great is his athletic ability. 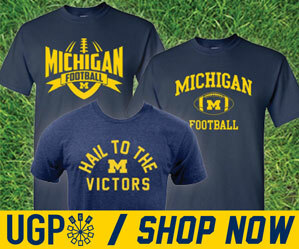 Ask anyone who loves Denard Robinson, "Why? ", and that's probably the reason they'll give you. He just makes plays. He's special. What almost no one will say, is that it's because he's such a great passer. He's not. This is not new news. Five straight interceptions last night proved that fact. The reason I say Denard isn't fully to blame, is because asking him to do something he's known for not being good at, is kind of like asking a racecar driver to change the tires. 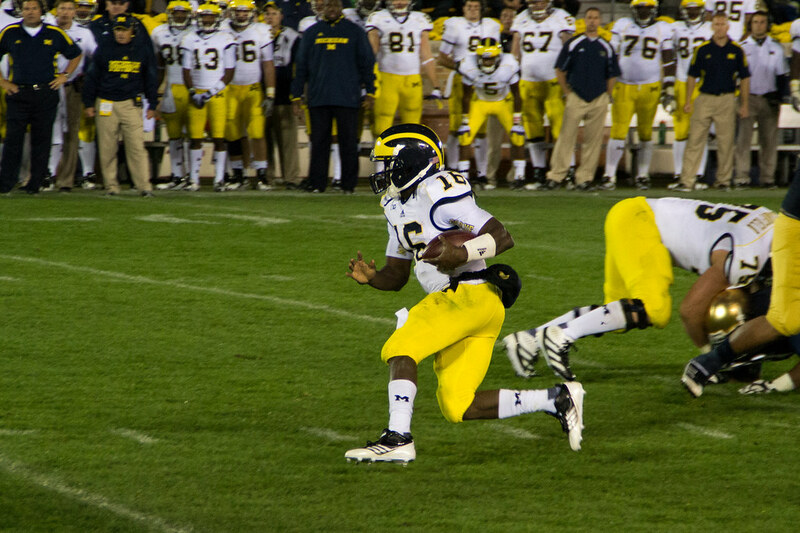 Michigan's offensive gameplan last night was to try and prove that Denard can beat you with his arm. Notre Dame forced Michigan to pass, and it worked better than they could have ever imagined. Its a plan that worked for Michigan State last year, in a game which felt oddly similar to last night. I get that you want to try and prove your opponent wrong, play into their weakness, because Notre Dame's secondary is certainly weak. But why, oh why would you take you best offensive weapon, and try to make him something that he's not? He's simply not a drop-back passer. Never will be. It's not what makes him so special. Michigan has to find a way to get Denard out of the pocket and into space where he can improvise. That's where he shines. That's where he belongs. Give him a running game, and suddenly it's nothing but 2011 Nebraska games from here on in.